A speedy recovery to Tony Holland (Harlequin Wheelmen) and the other 4 cyclists needlessly injured last week as they descended down McCarrs Creek Road from the Ku Ring Gai Chase National Park towards Church Point. Its difficult to comprehend the selfish mindset that spawned such an outrageously poor act towards innocent cyclists going about their own business. What drives an idiot to build a makeshift speed bump clearly designed to injure individuals. This isn't the first time cyclists have witnessed poor anti cyclist behaviour along McCarrs Creek Rd - its well known that the "Cyclist Warning" signs are regularly removed or vandalised, tacks and nails regularly litter the McCarrs descent (as late as only last week) and now a highly dangerous speed bump designed to hurt individuals. Cootamundra @ 25 August - Conor after 25k in the Chopping Block group with 75k to go. Cootamundra @ 25 August - Conor finished 25th from 100+ starters. The finishing line was on a nasty little steep berg (pictured) just out of Cootamundra. Conor finished 11th on the Sunday race over 65k is an outstanding effort. 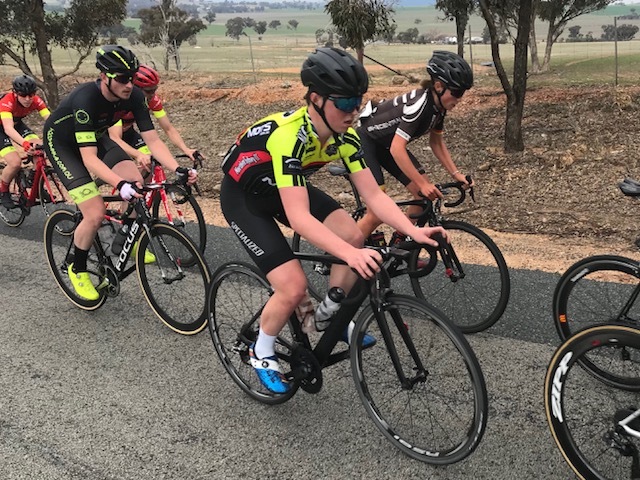 * Cootamundra Weekend @ 25-26 Aug - Conor Tarlington (BiciSport Happy Wheels) contested the Cootamundra Weekend series of CyclingNSW road handicaps. The new course was outstanding, over great roads and some truly picturesque scenery. Saturday was over 100k & Conor finished an excellent 25th. Sunday was over 65k and Conor finished 11th in the front group contesting the win. 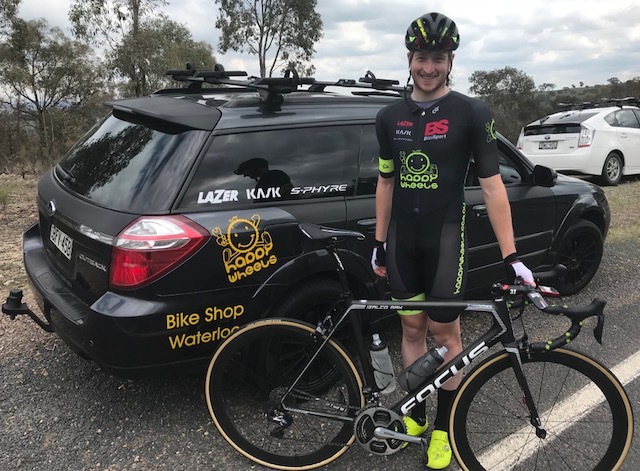 * National Cyclocross @ Essendon Fields (Melbourne) @ 25-26 Aug - Mike Lawson featured in the Masters M8 category and won the overall Series. Thursday Centennial Park Ride @ 23 August - the Thursday Morning Training Ride around Centennial Park starts at 10.30am from the Spruce Goose Cafe in the centre of the Park. All welcome. From L to R ... Mike O'Reilly, John Robb, Peter Stupka, John Crouchley, Karl Hoad & Mike O'Brien (visiting from the UK). Cootamundra @ 25 August - Conor T had a good Saturday with 25th outright from 100+ starters on a very picturesque circuit on the outskirts of Cootamundra. Sunday was one step better with 11th outright and in the bunch sprint for the victory.